Beautiful quilt, very good quality. Love the pattern. It fits my bird theme to a tee. This style would match almost all decors from rustic to modern. Highly recommend. City lovers will adore this quilt set. It's perfect for college students and those going off to college. The 7-pc set comes complete with 2 matching pillow shams, 2 pillow cases and 2 complementary decorative pillows. Part of the Rowley Birds Collection. Reversible Machine Wash Cold, With Similar Colors, Gentle Cycle. Use Only Non-Chlorine Bleach When Needed. After buying the shower curtain, I fell in love with the whimsical pattern in this quilt. The colors are very different from my normal so I am looking forward to decorating this room in a more kid friendly style. Love the bright colors! Love this print ! Well made and beautiful colors ! I first bought the shower curtain and loved it so much I bought the bedspread. Matches so many colors and in case it’s not evident in the photo the branches are grey. Nice light quilt for our king size bed. I love birds so this was right up my alley when we redecorated our bedroom. My only complaint I thought it was going to be longer on the sides but that could have been solved by me simply measuring the bed. So bright and cheery!! The day I received it, I found out I was going to be a Grandma for the first time, so I ended up decorating the spare bedroom as a nursery and used this for my inspiration!! The orange underneath and the brown "wire" that the birds are on, are both soft and muted. The birds are a little brighter. I want to get the shower curtain to match. Bought this for the cute design. I wanted something to add color to bedroom for guests. Cant wait to set room up. I purchased curtains and other accessories from this collection. Love it nice bedding set. I wouldn't call it "lush" , but it is very pretty and I like it!! Brighten up the guess room but not as soft of a fabric I was looking for. Make a bright dust ruffle and really added fun color to guest room. 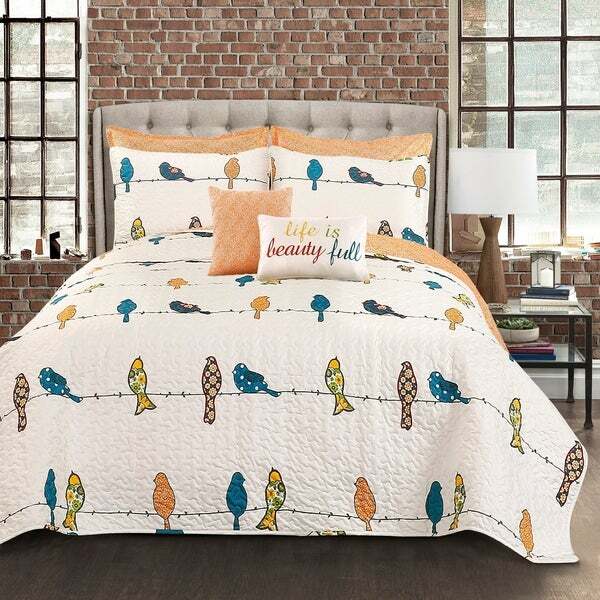 I love birds, was looking for a quilt and this adorable quilt was found on Overstock! "Is this really polyester or is it cotton?"